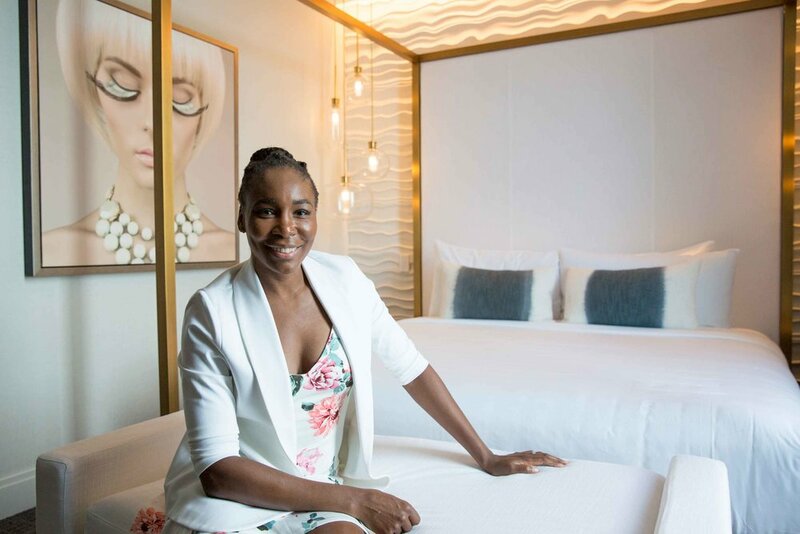 | Chicago, IL – October 11, 2018 | Venus Williams made a special visit to Chicago's Midtown Athletic Club on September 21, where she discussed her design businesses V Starr Interiors and EleVen with lucky members of the club and local media. She and her team at V Starr Interiors designed the Tennis Lounge at the club’s flagship location in Chicago, which underwent a landmark renovation, as well as The V Suite for the new The Hotel at Midtown. Williams and her Vice President at V Starr Interiors, Sonya Haffey, sat down with Hospitality Design Editor in Chief Stacy Shoemaker-Rauen, to answer questions about their inspiration for the two spaces, which unite Williams’ passions in one project and tell a story of her life from early tennis career to successful creative entrepreneur. The V Suite combines her love of design and hospitality, while the Tennis Lounge exhibits her dedication to tennis, including a striking feature wall composed of tennis balls. Her close connection to family is also displayed in the Tennis Lounge, where V Starr Interiors commissioned a painting by Venus’ sister, Serena Williams, which is currently on loan to Midtown Athletic Club. In addition, Venus’ love of fashion is seen in her activewear line, EleVen, being carried in the Club’s boutique shop. An EleVen trunk show featuring Williams’ FW18 athletic apparel collections took place after the talk. * Please email nico@fogandapple.com to request images from the event.